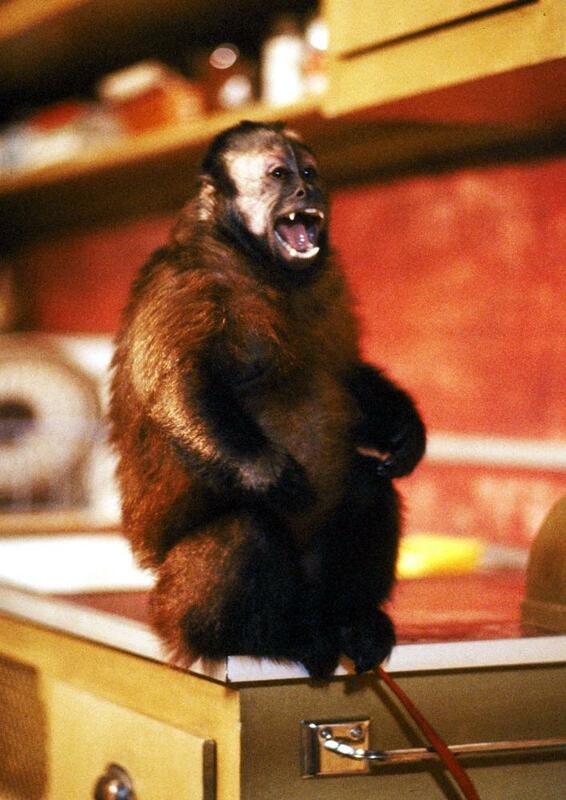 Digi-Schlock: MONKEY SHINES (Scream Factory Blu-Ray) – Schlockmania! 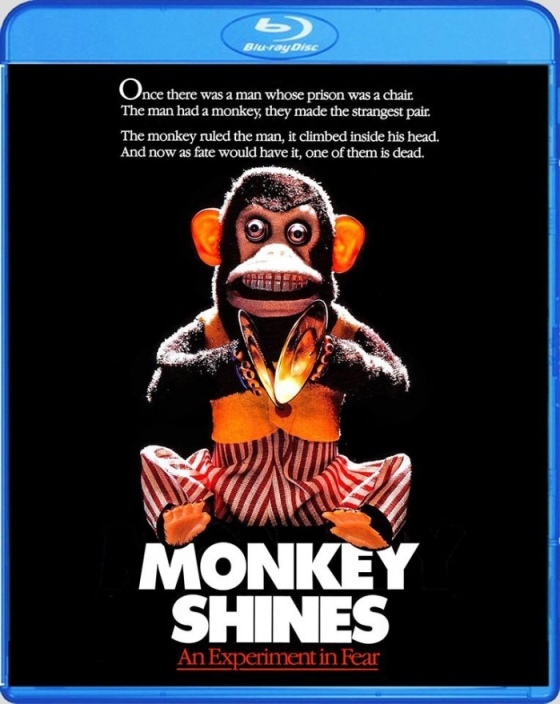 Monkey Shines represented the first steps toward Hollywood by indie genre legend George Romero and as such, has a story behind the story that is worth exploring. Unfortunately, earlier home video editions of this title were bare-bones affairs that offered no supplements to dig into this tale. Thankfully, Scream Factory has brought this title into the blu-ray realm and kitted the title out with an array of extras that explore the behind-the-scenes tale of his first foray into Hollywood distribution. A solid-looking transfer kicks things off. A lot of Monkey Shines takes place indoors in moodily lit settings and this presentation does a nice job of giving it depth and an earthy color palette. Both 2.0 and 5.1 stereo options are included, both in lossless form. The 5.1 track was used for this review and it’s a subtle affair that adds a gentle amount of dimension, particularly in its use of David Shire’s lavish orchestral score. This new disc also adds a healthy selection of bonus features. A commentary track featuring Romero and moderator Stuart “Feedback” Andrews kicks things off. It’s an informal yet informative affair that delivers plentiful info in Romero’s trademark laid-back style. 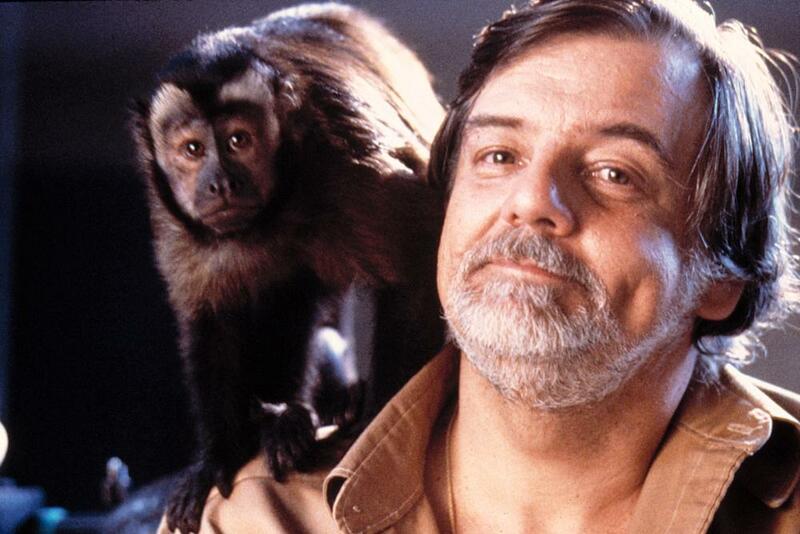 Romero describes the changes he made in the source novel, the challenges of directing a monkey and how Orion manipulated the test-screening process to change Romero’s ending. Andrews gently guides the process by adding plentiful questions that allow him to engage in a dialogue with Romero. In short, a quality listen for the director’s fans. The biggest of the extras is a nearly 50 minute featurette entitled “An Experiment In Fear,” an interview-driven piece that incorporates the input of Romero, producer Peter Grunwald, stars Jason Beghe, Kate McNeil and John Pankow as well as Tom Savini and members of his special effects team. It was produced by Red Shirt Pictures: RSP honcho Michael Felsher has a close relationship with Romero, which not only allowed for a nice roster of participants here but also ensured that it has a very frank tone about Romero’s Hollywood adventures. 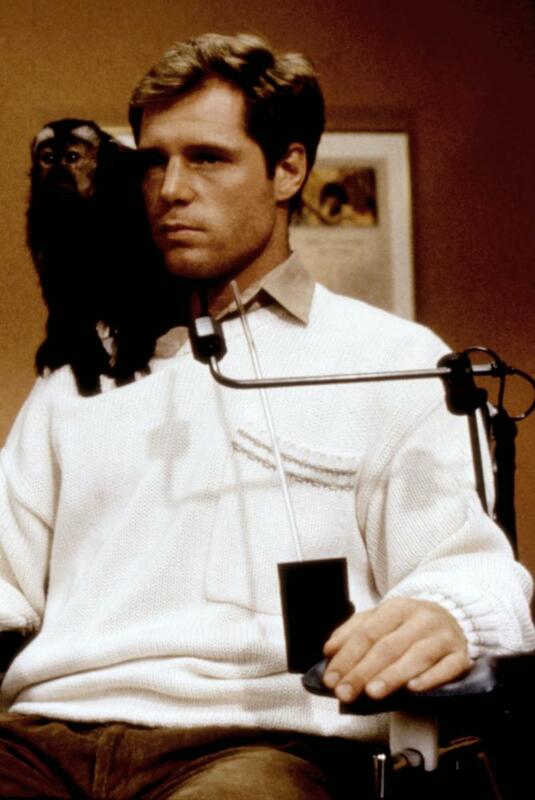 There’s plenty of choice tales about dealing with the trained monkeys – Beghe tells the best one about a “prank” that the main monkey played on him – plus Beghe and McNeil discuss the challenges of shooting their love scene and Savini and his crew give the viewer the lowdown on how he created monkey “doubles” for key moments in the film. Romero and editor Pasquale Buba tell a sad tale about why they had to drop several Ella Fitzgerald songs at the last moment and Romero reveals that the studio-mandated reshoot of the ending cost him the gig directing Pet Sematery. It’s a pretty absorbing piece overall – and be sure to stick around for a fun bit after the end credits. Plenty more small-scale extras follow. Four deleted scenes are included: most are scene extensions but there’s an interesting scene between Allan and his mom in there. 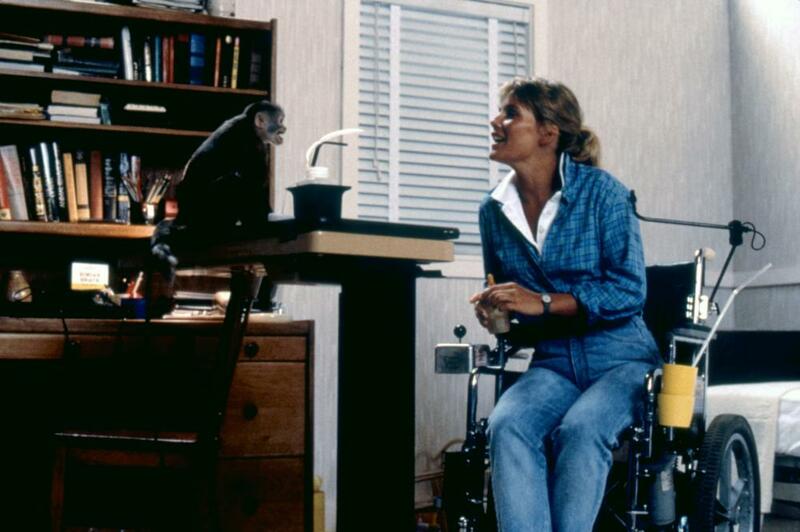 About 13 minutes of behind the scenes footage follow, including a glimpse into directing the monkey and Savini creating his monkey FX for the film. A still gallery offers up 30 makeup-FX oriented images, including a close look at a brain surgery scene that didn’t make the final cut. Two trailers and a t.v. spot show off Orion’s approach to marketing the film: one good trailer is driven by highlights from the film but the other two spots use a goofy cymbal-clapping monkey toy bit that probably hurt the perception of the film. A five minute EPK is nicely done, including Romero and his leads discussing the film. Along similar lines, there are more interview clips from the session that yielded the EPK and a 2-minute news story that plays up how the film used a real monkey for most scenes. All in all, Scream Factory has put together a nice disc that doubles as a tribute to one of Romero’s more overlooked efforts. Fans of the director and anyone who likes ’80s horror will find plenty to enjoy here.